It was a love fest at last week's Ludlow City Council meeting. Police Chief Scott Smith talked about how well his department gets along with the fire department, and Fire Chief Rob Dreyer returned the favor. Mayor Ken Wynn praised outgoing council members Dan Ashcraft and Bill Mullins, who did not run for reelection, and Michelle Cartright, who was not reelected in November. Wynn presented each of them with a gift on a night in which the new city council was sworn in. City Administrator Elishia Chamberlain applauded the council for working with her over the past two year's to improve the city's financial condition, and to set a tone that has led to Ludlow receiving a fair amount of buzz in recent months. The city hosted the latest Beyond the Curb urban living tour and recently announced its hope to attract a developer for the Ludlow Yards mixed used development project. "The last two years have been extremely productive," said Chamberlain, who took over two years ago. "Each individual up here has worked with the mayor to ensure we have some sustainability moving forward. I hope that the immediate response, the influx of calls, the enthusiasm, the interest in people wanting to move to the city for business or as residents are indications of the hard work that you've done and the hard choices that were not easy. "Our finances are in a status that I would say is impeccable for a city of this size, considering where we came from." "I enjoyed my time here," said Ashcraft, who served just one term. Work obligations, he said, prevented him from seeking a second two-year term. "No matter what you think of what we've done - you may hate everything we've done - we've tried everything to make this city better. The city is moving in the right direction and (the new council is) inheriting that." Mullins called the end of his time on council "bittersweet". He served four years as a councilman and promised two years ago that if elected, it would be his last term. "A number of people approached me about running again and I gave it serious consideration up to the last half hour of filing," he said. "I consider it an honor and privivlege to represent the citizens of Ludlow for the past four years. "My hope for the incoming council is you will come in with an open mind. You have been given a great deal of responsibility. There may be times you have to choose between making the popular decision or the right decision. I hope you err on the side of right over popularity." In closing, Mullins said that Ludlow had been the best kept secret in Northern Kentucky. "The secret is out," he said. "We have some pretty significantly talented department heads and what they do with the resources they have, you will find astounding and impressive," Cartwright said. "Continue to support them because they are definitely doing the right thing for the City of Ludlow." Incumbent council members Josh Boone, Tom Amann, and Bill Whiteley were reelected in November and will be joined by newcomers Jordan Scheid, John Gaiser, and Matt "Catfish" Williams, owner of the Folk School Coffee Parlor on Elm Street who finished with the most votes, despite it being his first run for office. Williams said his goal is "keeping up the good work of the previous council, the momentum of the city, and to keep Ludlow rocking." 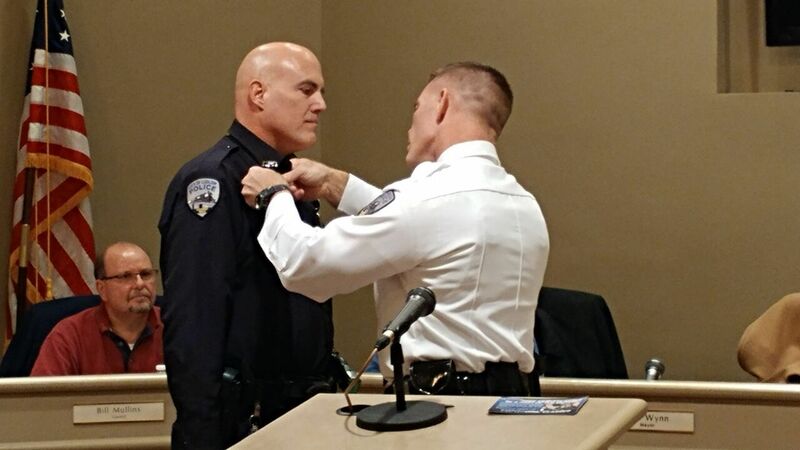 In Ludlow, Police Chief Scott Smith and state Senator Chris McDaniel (R-Taylor Mill) honored Officer Samuel Hodge with a Purple Heart after he was wounded in a shootout with a suspect in front of Riverside Market on Elm Street. Smith joked that the evening had become "a hug fest". "We're not just saying it for the glory of it," Smith said. "Lots of times you don't get a fire and police department getting along as well as we're getting along. You don't have the teamwork that this city does have. I do believe that we as police and code enforcement and public works - there's a lot of really good team-building stuff here that leads back to the mayor and Ms. Chamberlain." One familiar face will be replaced by another on the Newport City Commission. Longtime City Commissioner John Hayden decided to run for Campbell County District Judge in November, a race that he lost, and will not return to the city building in January. 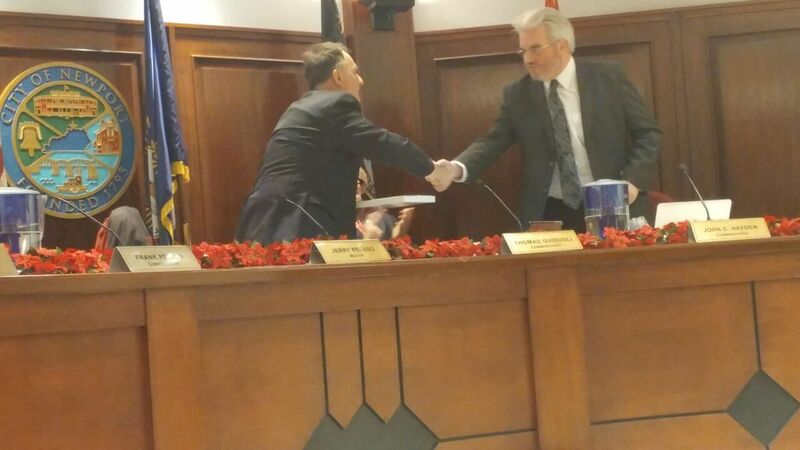 At Monday night's city commission meeting, Ken Rechtin was sworn in as his replacement. Rechtin was previously a city commissioner before going on to serve as a Campbell County Commissioner before losing his bid to become Campbell County Judge/Executive in 2014. Rechtin joins incumbents Thomas Guidugli, Frank Peluso, and Beth Fennell in January. Hayden first ran unsuccessfully in 2004, but was elected in 2008 for the first of four consecutive terms. "Nine years ago, before he started to run, he came out to where I work and introduced himself and said he was thinking about running for city commission. He said he felt like he had something to give to the community," Mayor Jerry Peluso said. "He asked for some advice and I basically said a couple things: listen to the people and just do the right thing. "I believe he has done that it has been a pleasure to work with you and I want to wish you the best in your future endeavors," Peluso told Hayden. "So much progress has been made, not because of John Hayden but because of the individuals that sit up here, and the city staff that work together as a group," Hayden said. "We don't always agree and sometimes we don't even like each other, but at the end of the day, we can come together for the best interest of the city. In eight years I've been here, I have never seen anyone sit up here and grandstand about anything for political gain." He paid compliments to his fellow commissioners, the mayor, and city department heads. "I'm very excited about where this city is going. Ken Rechtin, I wish you all the success in the world while you're here because your success is our success. I think the best days are still in front of Newport." 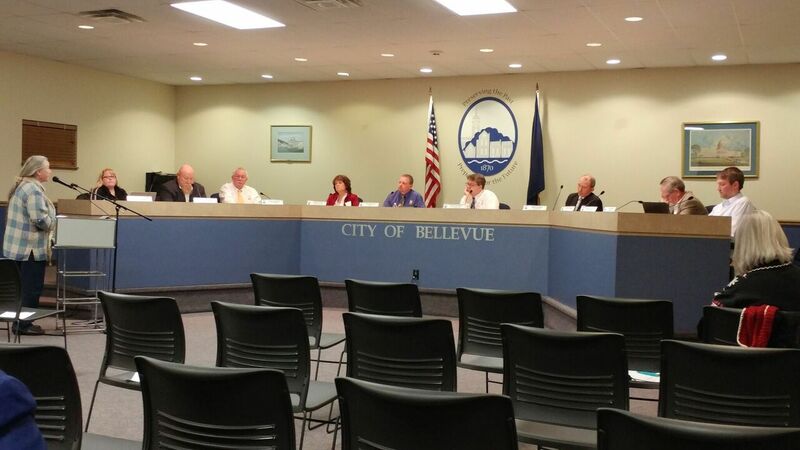 A similar story unfolded in Bellevue on Wednesday night where one longtime council member was leaving and another was returning. Matt Olliges was the only member of the city council not to seek reelection. The other five were reelected and former council member Carol Rich, who lost the 2014 race for mayor, won the open seat. She was sworn in with council members Steve Guidugli, Ryan Salzman, David Slater, Melissa Tatum, and Rodney Poynter. "I thank the citizens of Bellevue for electing me four times," said Olliges, a lifelong resident who has also served as a volunteer firefighter. "I feel like I made a few positive decisions and changes in my time in office. I think the community agrees. I think each election has confirmed that they liked the way I was doing things." Olliges talked about entering office in the middle of the Great Recession and the rebound that has taken place. "Over the past few years Bellevue has faced our share of challenges but we remain a good city to live in," he said. "My hope for Bellevue is that it remains a good place to live and my challenge to our city leaders going forward is that it's not just a good place to live but the best place to live, and I hope our groups can come together and muster the courage and leadership necessary to achieve those goals."